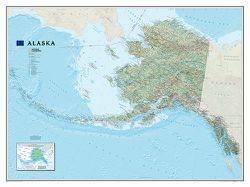 This attractive wall map of Alaska uses shading to show the mountain ranges and outlines indicate boundaries of the National Parks, Preserves, and Wildlife Refuges. The Aleutian islands are shown intact in their proximity to the rest of the state. A small inset shows Alaska's relative size to the lower 48 states.